Knorr Barbecue Sauce (Hickory Smoke) is made from a unique blend of tomato paste & spices for that special smoky aroma & taste. It enhances the flavour of any kind of meat & is also versatile to use as marinade, sauce/gravy base, dip or condiment for burgers and sandwiches. Tomato Paste, Sugar, Soybean Oil, Vinegar, Salt, Nutmeg, Spices, Permitted Flavourings (Contains Mustard and Peanut), Edible Gum, Caramel and Permitted Preservative (E221). All Food Additives Are of Plant and Synthetic Origins. May contain traces of cereals containing gluten, milk, fish, egg, crustasean, mollusc and tree nuts. 1. 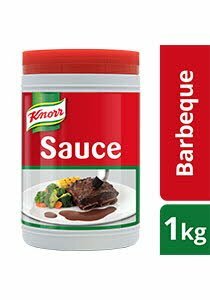 Use as a marinade - use 100g of Knorr Hockory Smoke Barbeque Sauce with 500g meat and marinate for at least 2 hours before cooking. 2. Use as a basting sauce - use 40g of Knorr Hockory Smoke Barbeque Sauce with 200g meat.